Information for patients with various muscle, nerve and functional problems of the vocal cords causing hoarseness. The terms “vocal hyperfunction” and “muscle tension dysphonia” have several different meanings depending upon the person using them. To me, muscle tension dysphonia is characterized by the vocal folds typically failing to come completely together because two muscles are pulling in opposite directions simultaneously. The vocal folds have the capacity and ability to assume the correct position for a task, but do not, because they are pulling against one another in an inefficient fashion. This is most likely a learned behavior. It is seen as a posterior glottic gap as in this 15 year old singer above. As another example, a vocal overdoer (someone who likes to talk) over time may develop vocal nodules. It may take many years for them to enlarge but eventually they protrude enough that when the vocal cords come together, the cords position themselves so the nodules just barely touch. This leaves the actual vocal folds slightly apart. This is because this is easier to phonate or make a sound than when they are compressed and touching. Squeezing them together dampens the vocal fold vibrations or require extra breath support (volume) to get them vibrating. Along comes a surgeon and the nodules are removed. During the post operative checkup the vocal folds assume the same position they did before surgery - slightly apart. There are no nodules holding them apart, they just assume that position as if the nodules were still there. Muscle memory is playing a role. The abductor (opening) muscles are preventing the vocal folds from completely closing even though they can actually close with the appropriate technique. It is analagous to piano playing a song for many years. Then, at a party, you try and play the same song on an electric piano and it is a tremendous struggle with mistakes flying around like popping popcorn. The piano keys turn out to be closer together and have a different resistance to pressing on them. Your brain is not used to this change and your fingers go where they think they should go rather than where they actually need to go. With some practice you could learn to play this electric piano as well, bu years of behavior need to be relearned. This is true in muscle tension dysphonia. Until the abductor muscles stops competing with the closing muscles, the voice remains impaired. Eventually, this gap may close “naturally” with learning. The other common example is a young singer or folk/pop singer who has developed a breathy style of singing. This is acheived by holding the vocal folds apart. It provides a soft quality to the voice and if this is the desired style, then it is wonderful. Numerous singers make very good livings with this style. However, if one is striving for a clear, efficient style of singing, with a high upper range, this muscle tension can severely impair singing. It also tends to impair the bottom extreme of a person's vocal range as well, because the marked shortening of the folds also tends to set the folds apart. To a certain extent, the patient can begin to self-train and feel the difference by phonating with a very harsh, biting kind of sound and then with a very soft edged, breathy sound on the same note and compare the difference. The term muscle tension dysphonia is frequently misused in another way when the examiner notes that a person's false vocal cords are squeezing together. Some physicians call this "plicae ventricularis". This squeeze may occur either side to side or front to back. 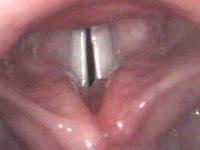 It is typically described as the false vocal folds touching during voicing (side to side). Alternatively it looks like the back of the voice box (the arytenoids) are touching the front (the epiglottis). Here is an example in an 80 year old male with severe vocal cord bowing. While this superficially appears to be a hyperfunction, this is really a masking of an underlying hypofunction. The hyperfunction is then not the problem, it is a symptom of the problem. The affected person is trying their hardest to produce a good sound and it is extremely effortful. In some cases the false vocal cords are the only possible way to phonate, such as after a substantial portion of the true vocal cord has been removed for cancer. Sometimes the extra squeeze merely brings the true vocal folds closer together or supports a weak true vocal fold. If one could see below the squeezed false vocal folds (and one can with adequate anesthesia) one would typically find that the true vocal cords are not closing completely or are not staying closed. This may represent a neurologic problem, such as a partial paralysis of one of the several muscles of the voicebox. It may represent severe vocal cord bowing. The bowing may be so severe that the vocal fold joints actually scissor or cross over one another at the back end just to get the middle of the vocal folds close enough together to even vibrate. This could represent a lack of tension within the vocal cord, a lack of muscle bulk or a lack of innervation to one of the muscles. If this lack of tension is from the thyroarytenoid muscle weakness (the muscle inside the vocal cord itself), stroboscopy or high speed photography may best delinate the problem. It can be seen on successive frames of the recording as an initial vocal cord approximation and then as a blowing out of the affected vocal fold. Listening to this type of vocal vibration will sound like a sail flapping in the wind, as sailing term called luffing. Patients with this condition will complain of vocal fatigue, poor endurance, pain in the voice box (typically hot, burning or achy type of pain). This is from excessive use of the neck muscles to support the weakened voice box muscles. The person may have an inability to yell and may have an obligate falsetto. The falsetto is a higher pitched voice than usual; think of an older man in your life with a somewhat female sounding voice. High pitches are created predominantly by the cricothyroid muscle. This muscle is supplied by the superior laryngeal nerve, a different nerve from the one supplying the rest of the vocal box muscles. Because of it's separate nerve supply, it often remains healthy even after an injury has impaired the recurrent larngeal nerve supplying the inside of the voice box. This muscle basically stretches and lengthens the vocal cords to create a higher pitch much like you would to tune up a guitar or a violin. If we have a vocal cord that is loose or floppy because the muscle within it is failing, the cricoarytenoid muscle may pitch in and tighten the vocal cord, increasing the pitch, so that at least now the person has a voice. If the person trys to lower the pitch, the voice just gets softer, breathier and has less volume. Thus the term obligate (mandatory) falsetto (high pitch) describes the technique used to speak. Therapy directed at relaxing the voice box fails to improve or even makes the voice less functional. The third condition that can be lumped under the term “hyperfunction”, is a type of non-organic dysphonia. Non-organic dysphonia can present and look like hyperfunction (on video). In this case, the underlying vocal folds are normal and work well, but an inappropriate behavior has developed of squeezing tight the upper part of the voicebox. A person may develop laryngitis. The vocal cords become swollen and stiff. To get any voice at all the person with laryngitis must squeeze extra hard to get the vocal cords together and vibrating. In the process, the false vocal folds are squeezed closer or may even start vibrating to produce a very deep voice. Now, the cold causing the laryngitis should resolve in a reasonable period, perhaps two weeks. However, because of some secondary gain (and this is usually an unconscious gain) the voice problem seemingly persists. The hoarseness remains even though the swelling is now resolved. The types of secondary gain I have seen range from the obvious: “If my hoarseness last for a few more days, I’ll be able to collect disability” to the very subtle, family or school commitments may have been relaxed because of the illness or the person is just getting a little extra, much needed attention from those surrounding them. This non-organic (learned) behavior is very easily and quickly correctable - often during the initial examination - completely restoring a normal voice. Keeping the normal voice may be harder because typically the physician or therapist doesn’t or can’t resolve all the stresses and obligations in a persons life. The problem may reoccur unless these other issues are dealt with. This is not “craziness”. This is the way a normal compensatory mechanism becomes the problem itself and it is the way that our minds work. Recognizing the issues goes a long way to restoring and maintaining vocal health. So, muscle tension dysphonia or vocal hyperfunction can represent a long term learned behavior that needs appropriately directed therapy or vocal training to correct/improve it. It may represent a compensatory mechanism for an underlying weakness, neurologic paresis or lack of tension (bowing). This almost never improves with therapy directed at relaxing the “hyperfunction”. Voice building exercises or surgical augmentation to reintroduce bulk and support to the affected vocal fold(s) may be a solution. If the underlying problem is from stiffness, surgery might be directed at softening the vibrating edge of the vocal cord. Thirdly, one form of non-organic dysphonia is a “hyperfunctioning” supraglottis (the false vocal folds). Therapy directed at restoring the normal voice is usually quite successful. In rare cases, deeper probing into the stresses or obligations perpetuating the condition may be helpful.